But we happily discovered that yes, many of the bars in Park City can make a decent – and well above that – cocktail. 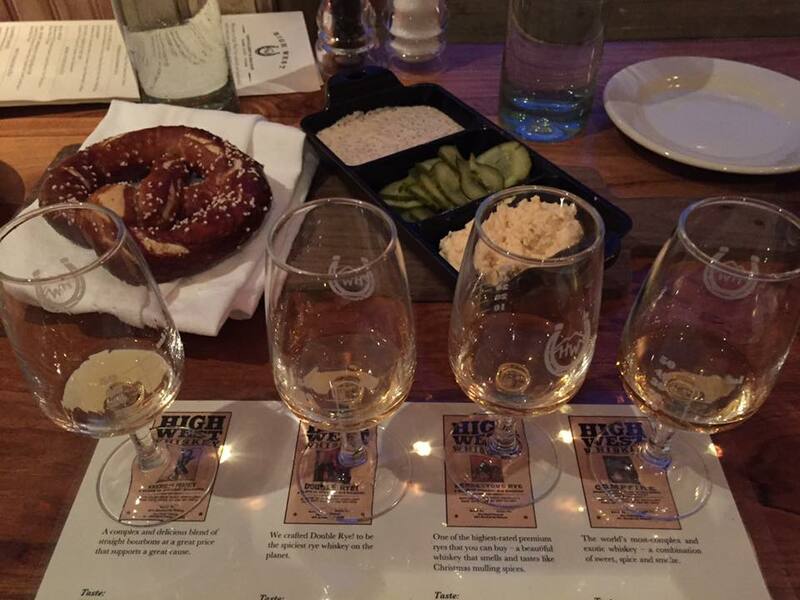 For this article I will stick to the one I reviewed: High West Distillery. 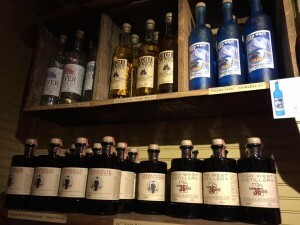 I sampled some of their single spirits, bottled barrel-finished cocktails and even managed to try a couple of cocktails. We also enjoyed lots of “comfort food”, as one guest called it, which was served up in several welcoming rooms encompassing three floors of the Saloon location. Our server, Jessica, was extremely helpful in guiding us to the favorites of the menu. 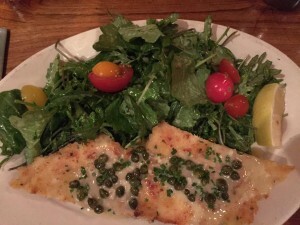 We wanted to try many of the mouth-watering dishes and the ones we did have notes in italics. Bacon and Cashew Caramel Popcorn, BBQ Dusted Potato Chips, Pretzel and Beer Cheese (whiskey was also in the cheese, so good! ), then onto Braised Beef Short Rib (hubby had that, very tender), Chicken Pot Pie, House Smoked Salmon, Lamb Stew, Chicken Schnitzel (with a wonderful lemon-caper sauce I loved! ), Mac and Cheese, Sweet Potato Mash, Wild Berry Cobbler, S’More, Butterscotch Budino, Chocolate Manhattan Mousse (of course we couldn’t resist this one! Loved the “Swiss dark chocolate, High West Barrel-Aged Manhattan, Honey Brittle” and it was the perfect finish to our evening…though we fought over the last mouthful. Blend of 2 to 13 year old straight bourbons. Smooth, smoky and low on the harsh levels. Blend of 2+ year-old rye. Traditional flavor, nice and creamy. Blend of 6 to 16 year old straight rye whiskeys. Very balanced, with a golden delicious apple flavor that really popped. Had it all: smoke, caramel and peat. Well done! A favorite at the saloon; with flavors of honey and caramel. Boulevardier is on the right…and it was my favorite. Bourbon, Vya brand sweet vermouth and Gran Classico bitter amaro is blended in American oak Bourbon barrels until the distiller has deemed it ready for bottling. This was my personal cocktail favorite, it was unique to anything I’ve had…and I’ve had a lot! If you are a brown spirit fan you’ve got to seek this one out. The menu describes a grapefruit component that was really interesting. The “36” is a nod to Utah being the deciding vote to end prohibition. It’s basically two parts Double Rye Whiskey, one part sweet vermouth, and two dashes of Angostura bitters for every 2.5 ounce serving. It rests in a 2-year-old rye whiskey barrel for 120 days before bottling. Classic aroma and flavor of a Manhattan, but with a nice bite to it. Very pleasant. I loved this cocktail, difficult to describe but like the Boulevardier, it had some unique qualities for me. Traditional flavors with the addition of cinnamon. Final note: There is an extensive cocktail, wine, bubbles, beer, single malt and additional spirits list, on the backside of the dining menu and in a separate menu. So if your palate desires something different than what we sampled, you are covered. There is also a “general store” where you can purchase their spirits and other merchandise. We checked on the two bottled barrel aged cocktails we really liked and found that we could purchase in L.A.